Seconds later, Overd is approached by a police officer who orders him to leave the area. “For God so loved the world, guys, that He gave His only begotten…” Overd declared, resisting the order. The officer consequently immediately grabbed Overd by the arm while he was speaking and pulled him away. The crowd clapped and cheered enthusiastically. In addition to Overd, Americans Mike Stockwell and Don Karns were taken into custody, as well as Bristol resident Adrian Clark. According to reports, the men were charged with violating Section 5 of the Public Order Act and released. “A person is guilty of an offence if he—(a)uses threatening, abusive or insulting words or behavior, or disorderly behavior, or (b) displays any writing, sign or other visible representation which is threatening, abusive or insulting,within the hearing or sight of a person likely to be caused harassment, alarm or distress thereby,” the law reads. 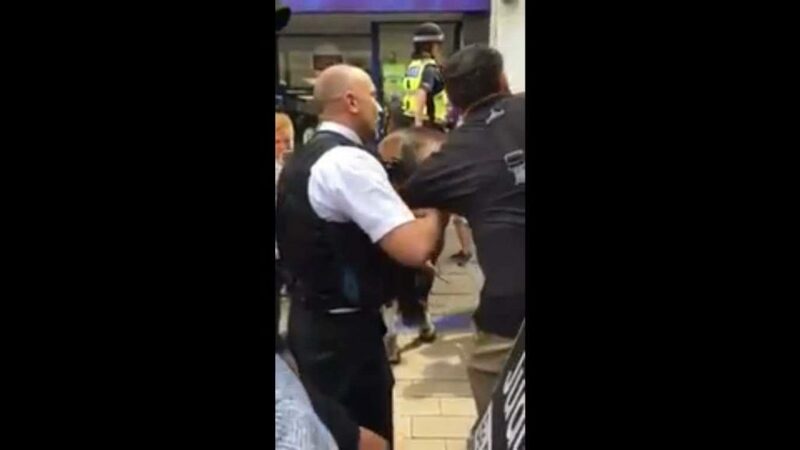 The Bristol Post claims, according to a witness, that the men had stirred the crowd by preaching that “Allah does not exist” and that Muslims will go to Hell, as well as speaking harshly about the sins of homosexuality and divorce. It is not known whether the street preachers actually spoke on the subjects or if they were falsely accused out of a heckler’s veto. As previously reported, Overd was accused in 2014 of speaking against homosexuality and Islam, and was leveled with two charges of using threatening and abusive words and a charge of causing racially or religiously aggravated harassment, alarm or distress under the Public Order Act. He was initially convicted by Judge Shamim Qureshi, a Muslim, who expressed concern that Overd quoted from Leviticus 12:13, which reads, “If a man also lie with mankind, as he lieth with a woman, both of them have committed an abomination. They shall surely be put to death; their blood shall be upon them.” Quereshi said that the preacher should have selected another verse that was less offensive. But Overd told Christian News Network that he never quoted from Leviticus at all, and that the claim was false. Last December, Circuit Judge David Ticehurst overturned the conviction due to insufficient evidence from the prosecution.